A one bedroom condo in hip Old City Philadelphia? $300,000. Good closet space wherever you live here in Center City Philadelphia? Priceless. 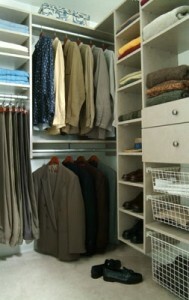 Good closet space inside a Philadelphia condo is like a good wine. Coveted, hard to find, and treasured by all. With a high percentage of my buyers being of the “Empty Nesters” set, I find that their preference for good closet space can not be ignored. Downsizing from a larger home is traumatic enough in itself, without have the added turbulence of deciding what to keep, what to give away, and what to simply heap into a large pile, and burn. There is one condo development here is town that many of my buyers find quizzical: The good sized two bedroom condo units do not have walk-in closets. Only the medium sized one bedroom condo units in the building have a walk-in closet. Odd, they say- and I can’t disagree. Dockside in Philadelphia offers two healthy sized walk-in closets in their two bedroom condo units. I thought I was going to have a heart attack when I saw that act of generosity. I do believe that the lack of closet space must be coming from some NYC consulting firms, used by local developers when putting up a new high rise condo building here in Center City. I know New Yorkers don’t seem to value kitchen size as much as Philadelphians, but could it be that they travel lighter as well, and don’t have as much stuff to store as we do? Who knows! But a bit more attention to good closet space by Philadelphia developers would be a huge help in their sales efforts here in Center City (in my humble opinion)! I talk about a lot of stuff about Center City real estate. Click onto my “podcasts” link on www.CenterCityCondos.com to hear me go “off” on everything that is Center City real estate!